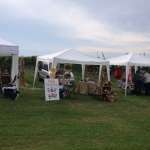 Tips for successfully marketing your crafts – and yourself – when vending. 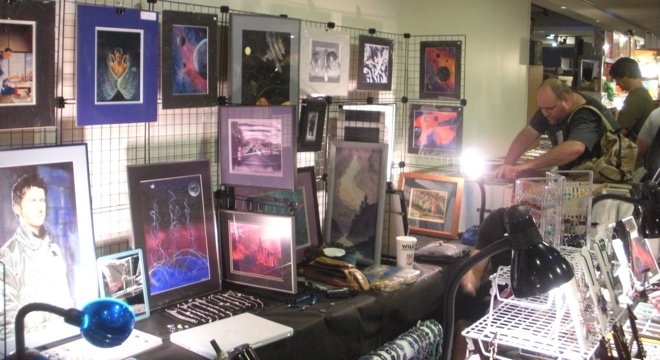 Art on display – and shoppers – in a vendor’s hall. Photograph by the author, sockii. 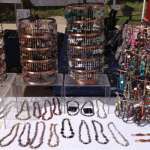 This is the fifth article in my series on becoming a craft show vendor. So far we’ve covered almost all of the basic information you’ll need to know before actually working your first show: the basics of being a vendor, choosing and setting up your displays, finding craft shows to work, and how to set your prices. Now it’s time to get out there and start selling – or so you hope! Successfully interacting with potential customers at craft shows is a critical part of being a vendor. Each vendor will have her own technique, style and personality but there are a few important “do’s and don’ts” you should keep in mind. These unofficial rules of vending will help encourage browsers to spend time at your table or booth, and hopefully buy something from you before moving on. They can also help you build a clientele of regular and return customers, which is important for being a successful vendor in the long run. The author, dressed for Dragon*Con! 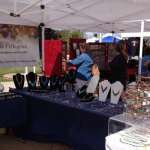 A vendor should put her best foot forward when working a craft fair. You are going to put your highest effort into displaying your merchandise, so do the same with your personal appearance. Leave the baggy sweatpants and worn-out old t-shirts at home – a sloppy appearance may lead customers to think your work is similarly sloppy. You don’t have to wear a three-piece suit or fancy evening wear, but try to fit the atmosphere of the event with appropriate yet attractive attire. Dress comfortably enough that you can get your set-up done without tripping over high heels or long skirts. 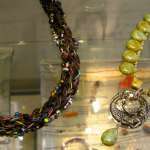 And absolutely model your own work if your crafts including clothing, jewelry or other accessories! A positive, cheerful attitude is important in selling at craft shows. No one wants to buy merchandise from a vendor who looks bored or unhappy to be there – I’ve even seen vendors who were fast asleep behind their table, a surefire recipe for disaster. Smile and say hello when someone comes to your booth or table, and offer to answer any questions she might have about your work if she looks interested. Encourage buyers to try on clothing or jewelry, to touch and handle merchandise, or offer assistance if items are fragile or kept in closed display cases. That said, try to avoid a memorized sales pitch – not only will it sound forced to customers but it will annoy your neighboring vendors after hearing it a hundred times in one day. Also, don’t shout after or appear too desperate to have customers come or stay at your table. There’s a delicate balance to strike between being friendly and being pushy, and being pushy will often just make people run away. Also realize that you will never be able to read every customer’s mood or interaction desires perfectly. Some people will scurry off as soon as you look at them or even smile politely. Others will want to be fussed over and catered to, telling you their entire life story while browsing your merchandise. Be flexible in how you deal with customers but know you will not be able to please everyone. CHECK PRICEBeing a vendor means interacting with many different kinds of people – including some who will ask you bizarre questions, treat you and your merchandise with disrespect, and otherwise act bizarre and rudely toward you. 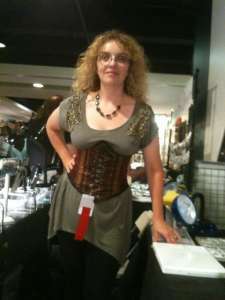 In fact I’ve written an entire article on etiquette for craft show customers after having experienced so many thoughtless and crass situations, such as parents allowing their children to run rampant through my booth without supervision, or people insulting or mishandling my crafts thinking it would get them a bargain. The important thing to remember as a vendor is to always remain as calm and as polite as possible in such situations. If people are thoughtlessly blocking traffic to your table while holding a lengthy unrelated conversation amongst themselves, try to find a way to encourage them to move on without directly ordering them to do so. For instance, I find a reason to have to go to the front of my table and re-arrange a display stand or put out different merchandise. A firm but polite “Excuse me” as I urge them to step back tends to get the hint across. If someone is asking you questions which make no sense or you have no answer for, just say, “I’m sorry, I don’t know,” and try to engage with other customers instead. If someone is mishandling your merchandise or displays – such as putting a sweating drink container on your leather display pads or dropping delicate items on the ground, do not feel guilty in asking them to please not do such things. Be firm yet don’t yell at them. Your merchandise should be treated with respect and care, and having an expensive display piece ruined because of thoughtlessness is not worth potentially offending one casually browsing customer. If a person actually appears to be a hazard to you and/or other vendors and customers, alert the craft show staff as soon as possible. At open air events you never know who may pass through a craft show, and sometimes you may get mentally unstable individuals drawn to the crowds, those who have had too much to drink or even illegal drugs and are not operating at normal mental capacity. The event staff should be able to evaluate the situation and the individuals involved and determine whether they can handle it, or potentially need to call in the police or emergency services to do so. In the last article on pricing, I talked about how it is your choice, as a vendor, if you wish to allow bargaining and haggling over your prices. I find it can be a good sales trick to offer deals for customers interested in more than one item, or to offer a discount on purchasing a set versus individual pieces. For instance, I might offer $5 off a pair of earrings if purchased with a matching necklace, or a 10% discount on purchases over a certain amount such as $50 or $100. But don’t feel obligated to immediately offer a sale price on an item just because a customer asks for it. If your sales are slow at a show, you may wish to start bargaining just to clear your expense costs. But remember that a craft fair is not a flea market and customers should not be encouraged to think they can offer you a dollar for a twenty dollar item. When someone makes a purchase, make sure you include a business card or receipt with your contact information on it: email, phone number, mailing address and/or website. You want to ensure the customer can reach you at a later time to find out what other craft shows you are working, if something needs to be repaired or adjusted, or for a custom order. Building a good base of recurring customers is very important for being a successful vendor – you want people to specifically come to a craft show looking for you and your work, before they start spending their money on others! Dealing with customers successfully is an absolutely necessary skill for craft show vendors. Keeping up a positive attitude and friendly demeanor will help encourage purchases, but you must also know when to stand your ground when dealing with rude or inconsiderate individuals. Finding your personal style as a vendor will take some time, but once you do you will likely be rewarded with better sales and happy return customers. In the concluding article in this series, I will discuss issues of dealing with other craft show vendors and craft event organizers which are necessary to keep in mind. Just as important as how you deal with customers is how you deal with event staff and other vendors – who can either help make your vending a success or a failure based on how you deal with situations which may arise. Great information. Maybe I missed it but can you tell me what I need legally to sell collectibles at a local comiccon. For example: I know I probably need a business licenses, right? Note: I dont have a store front. I would just like to sell my collection. Thanks. 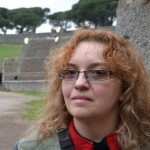 Hi, thanks for the read and the comment. It really depends on the venue, size of the show, and other factors like the state you are living in. Some states, in my experience, make it very easy for one to get a temporary sales tax ID for a single vending event. Either the convention itself provides the forms to submit after the show or you can get them from the state’s tax website. If it’s a very, very small con with limited membership – no walk ins/day passes sold – not having a sales tax/business license is generally not a problem b/c it’s considered a “private event”. Where it gets more iffy is with the larger comiccons and other conventions where you may not even be able to apply as a dealer without providing a sales tax id. Best thing to do is contact the dealer’s room coordinator for an event directly and find out what there requirements are: if it’s set up for private collectors to be able to sell/trade their wares or if only licensed business operators can get dealer’s room space.